Turk Malloy: Is it in yet? I am a member of minority group. 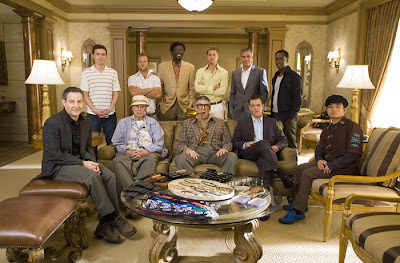 This group is made up of a small number of people who actually enjoyed OCEAN’S 12. Sure it was somewhat unbelievable and occasionally ridiculous but it kept a good groove on while filling the screen with some slick style. The boys all looked like they were having a good time, perhaps too good a time. Maybe audiences felt like they had taken it all too far; that the Ocean gang was having fun without them. 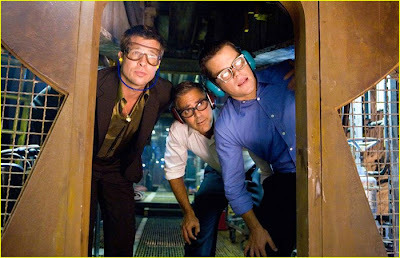 And so, a director and a cast who generally don’t seem to pay much heed to appeasing the masses, have returned to the original scene of the crime, Las Vegas, for their third and final caper in OCEAN’S 13. The main goal for this reunion is to make up for their supposed misfire last time out and every possible effort to do so is made diligently. With the exception of Julia Roberts, the original players have all returned. From Clooney to Pitt to Damon to Affleck (no, not that one, the younger one), the stars are all out. Even Al Pacino has come on board to lend more weight to this already heavy load. And with Mr. Style himself, Steven Soderbergh, at the helm, the dream is kept alive. So why then, with every element so perfectly placed, has the fun disappeared almost entirely? Perhaps perfection is part of the problem. The Ocean gang is a smart bunch, crafty fellas. They are also often prone to making mistakes. The situations they find themselves in stem from their own decisions and almost always lead them to the brink of unraveling. The cracks they need to squeeze through get tighter and tighter, creating both intrigue and urgency for the viewer. 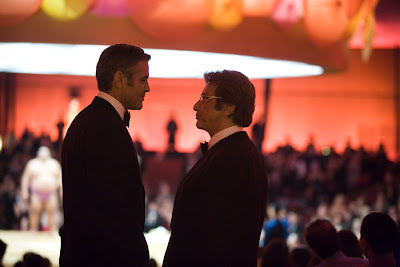 OCEAN’S 13 finds Danny Ocean et al plotting sweet revenge against Willie Bank (Pacino) for putting Ocean member, Reuben Tishkoff (Elliott Gould), in the hospital after screwing him out of a huge hotel/casino deal. The plan is to ruin his prestigious grand opening and milk him for hundreds of thousands of dollars all in one night. The execution is vast, ranging from rigging the dice at the source of manufacturing in Mexico to orchestrating an earthquake to disarm the stronghold security system that stands between them and the prize. Clearly, the good guys are going to win but never does it feel that there is a chance this might not happen. The urgency and intrigue were bet and lost. Pacino is a welcome addition to the mix. His portrayal of hotel mogul, Willie Banks, is so sinister and egotistical that you can’t wait for the Ocean boys to bring him down. However, while Pacino is stepping it up, Clooney and Pitt might as well have had their stand-ins play their parts. The camaraderie that brought such joy and laughs to the Ocean film experience in the past has grown tired. When the boys laugh now, it almost seems like the joke is on us; that getting us into the theatre with their pretty faces was all they were obliged to do. Once there, entertaining us was not part of their contract. These two haven’t left it to just showing up for work in a while and the effect weighs you down. Luckily, Damon, Affleck, Scott Caan and Don Cheadle are still working for their paychecks, bringing wit, charm and humility to an often-lifeless script. Sadly, the sporadic laughs are not enough to call this film funny, or even fun for that matter. 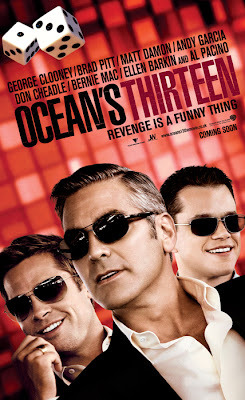 So if OCEAN’S 13 isn’t fun, what is it? Well, it’s neatly packaged and pristinely presented. Soderbergh has a fantastic eye. He has a knack for crafting colorful films that are visual worlds unto themselves, which draw the viewer in to a point where the real world can look somewhat drab in comparison once you leave them. Only this time out, he spent too much time setting everything up that no room was left for error or chance. It’s like a perfectly dealt hand that just isn’t played with any finesse. It’s ironic really how a film set against the gambling capital of the world takes so few risks. Soderbergh sets out to distract the audience with OCEAN’S 13, like any good casino would. With all the flashing lights, pretty colours and fireworks, you might not realize that you’ve been playing the slots for longer than you should.